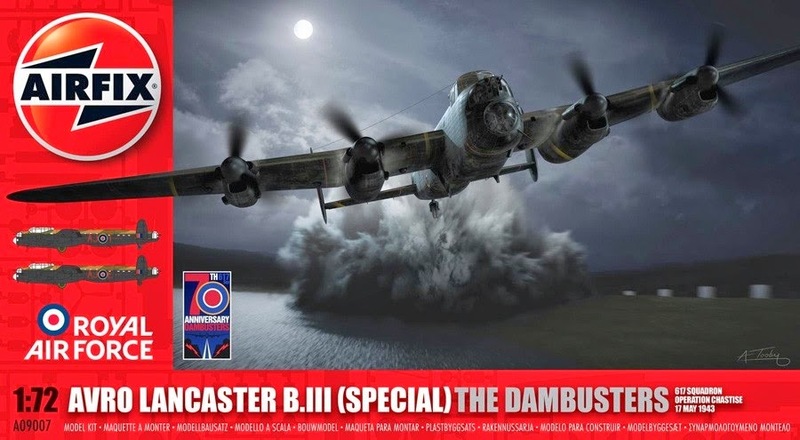 BoweModels: Reveal - Airfix 1/72 Avro Lancaster B.III "Dambusters"
Reveal - Airfix 1/72 Avro Lancaster B.III "Dambusters"
This is a bit of self indulgence, the Lanc is my favourite aircraft of all time and this is a brand new tool from Airfix depicting the "Boy's Own" favourite, the Special Type 464 , a.k.a "Dambuster". This new version from the re-vitalised Airfix is a seriously good kit, although suffers from a handful of fitting problems and vastly over scale panel lines. But it's accurate and crisply moulded, and dare I suggest it might just be the best 1/72 Lanc kit ever? I added some goodies from Eduard and scribed a few rivets to add authenticity. A few parts did need adjustment to get a good fit and overall the build was a little more complex than I had anticipated, but it does build into a very good model as I hope you can see.